The anticipation just got higher for the big unveiling tonight (May 29) of the first-ever manned Dragon spaceship by the private spaceflight company SpaceX, with two new photos offering tantalizing glimpses inside the spacecraft. 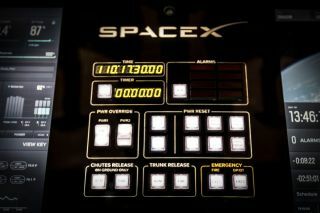 The new SpaceX Dragon photos reveal what appear to be close-up views of a capsule control panel and one of the vehicle's seven seats for future astronaut missions. SpaceX posted the photos to its main webcast page ahead of the 10 p.m. EDT/7 p.m. PDT (0200 GMT) debut of its manned Dragon craft. SpaceX CEO Elon Musk hinted at tonight's major Dragon reveal on April 29 in Twitter posts announcing the manned spacecraft's unveiling. Since then, the company's latest unmanned Dragon capsule returned from space after a month-long voyage to the International Space Station. It was SpaceX's third of 12 unmanned Dragon cargo delivery flights to the station for NASA under a $1.6 billion contract. SpaceX hopes its manned Dragon V2 spacecraft, called the Dragon Version 2, or Dragon V2, will fly NASA astronauts on roundtrips to the space station and restore the human spaceflight capability of the United States. NASA's 30-year space shuttle program retired in 2011, leaving the agency depending on Russia's three-man Soyuz capsules as the only way to launch American astronauts into space. The Dragon Version 2 space capsule resembles SpaceX's unmanned spacecraft, but is designed to ferry a maximum crew of seven astronauts to and from low-Earth orbit. Like the unmanned version, Dragon V2 will launch into space atop SpaceX's Falcon 9 rockets. But the manned capsule is also equipped with SpaceX's new SuperDraco thrusters, which serve as an emergency escape system to pull the capsule free from the Falcon 9 in the event of a major malfunction. SpaceX hopes the thrusters can also be used to cushion landings on the ground in the future. Musk will unveil the Dragon V2 spacecraft tonight during an invite-only event at the company's Hawthorne, California, rocket factory. Musk founded the company in 2002 with the goal of lowering the cost of spaceflight with more affordable, reusable rockets. Since then, Musk has repeatedly said his long-term goal is to see humanity colonize Mars and become a multi-planet species.